At least 31 people have been killed and dozens more wounded after two suicide bomb attacks in Damascus, state media reported, the second double bombing in the Syrian capital in five days. 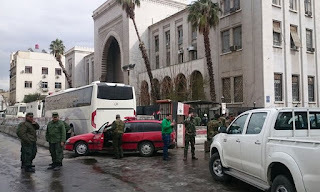 The first suicide bomber targeted the Palace of Justice, the main courthouse in central Damascus near the Old City. The justice minister, Najem al-Ahmad, told reporters the initial death toll was 31, mostly civilians. The second suicide blast struck a restaurant in the al-Rabweh area, to the west of the first attack, causing several casualties, state media reported. State news agency SANA cited the Damascus police as saying that there were 102 injured in the courthouse attack and 28 injured in the restaurant. Analysts who follow Syria have predicted that, as jihadist rebels fighting to oust President Bashar al-Assad suffer military reverses, they will increasingly turn to guerrilla attacks in territory controlled by the government. The bombings come on the sixth anniversary of the start of the Syrian conflict, which began with anti-government demonstrations in March 2011. There has been no immediate claim of responsibility. The courthouse bomber set off an explosive device at 1.20pm as police tried to search him and stop him from entering the building, state television reported the Damascus police chief as saying. Syrian state television broadcast footage from inside the courthouse showing blood splattered on a floor littered with papers, a shoe, broken tiles and stones. Images from a hospital showed a man in a suit on a stretcher with blood on his clothes. The explosion hit the courthouse at a time when the area was crowded with lawyers, judges and civilians, harming a large number of people, Ahmed al-Sayyid, a senior state legal official told state-run al-Ikhbariya TV. “This is a dirty action as people who enter the palace are innocent,” he said, noting that the timing of the explosion appeared to have been planned to kill the largest number of lawyers, judges and other people who were there at the time. On Wednesday the UN Syria envoy, Staffan de Mistura, said negotiations to end the war must speed up. On Saturday, scores of people, most of them Iraqi Shia pilgrims, were killed in a double suicide bombing in Damascus claimed by an alliance of jihadi groups known as Tahrir al-Sham.